Search engines like Google allow website owners to exclude content from search results. You can do this by using your site’s robots.txt file or using HTML meta tags. We will show you how to do this in WordPress using two methods. You can choose the one that works best for you. We will also show you how to password protect posts and pages in WordPress. If you don’t want to use the first two methods, then this approach will allow you to control the visibility of your posts and pages for all users. This method is easier and recommended for beginners. First thing you need to do is install and activate the Yoast SEO plugin. For more details, see our step by step guide on how to install a WordPress plugin. If you are new to Yoast SEO, then you may want to see our guide on how to install and set up Yoast SEO plugin. Next, you need to edit the post or page that you want to hide from search engines. Scroll down to the Yoast SEO meta box below the post editor and click on the advanced settings button. The advanced settings section allows you to add meta tag robots to your blog posts or pages. Using the robots meta tag, you can tell search engines not to index or follow a page. First you need to select ‘noindex’ from the drop down menu next to ‘Meta robots index’ option. After that, click on ‘nofollow’ next to ‘Meta robots follow’ option. You can now save/publish your post or page. This line simply tells search engines not to follow or index this page. This method requires you to edit the robots.txt file. Adding incorrect instructions in this file can have adverse affect on your site’s SEO, which is why it is not recommended for beginner users. The robots.txt file is a configuration file that you can add to your WordPress site’s root directory. It allows a website to provide instructions for search engine bots, hence the name robots.txt. For more information, take a look at our guide on how to optimize your WordPress robots.txt for SEO. You can edit robots.txt file by connecting to your website using an FTP client or ‘File Manager’ in your WordPress hosting cPanel. You will need to add these lines to your robots.txt file. The user-agent line allows you to target specific bots. We are using asterisk sign to include all search engines. Here is how you will add this URL to your robots.txt file. Don’t forget to save your changes and upload robots.txt file back to your server. First you need to keep in mind that robots.txt file is publicly accessible. Anyone can access it directly to see if there are any pages you are trying to hide. While most search engines follow the instructions in robots.txt file, many other crawlers and bots may simply ignore it. These are the bots crawling the web to spread malware, target websites, or harvest information like email accounts, phone numbers, etc. This method uses a different approach. Instead of asking search engines not to index a page, you can password protect it, so that it is only visible to users with the password. WordPress comes with a built-in feature to password protect posts and pages. Simply edit the post or page that you want to protect. Under the publish meta box, click on the ‘Edit’ link next to ‘Visibility’ option. This will show the visibility options available in WordPress. You can keep a post/page public, make it private, or password protect it. Private posts are only available to logged in users who have at least editor user role on your website. Password protected posts can be seen by any visitor who has the password. Click on password protected option and then enter a strong password. You can now publish or save your post/page. Now visitors accessing the post or page on your website will be asked to enter the password to view the content. For more detailed instructions, see our guide on how to password protect posts and pages in WordPress. 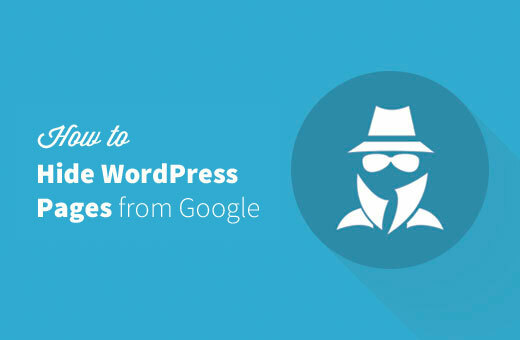 That’s all, we hope this article helped you learn how to hide a WordPress page from Google. You may also want to see our guide on how to stop search engines from crawling a WordPress site. After you make these changes how long does it take for the page to stop showing up on Google searches? That would depend on when Google clears its cache. For the Yoast plugin, the settings look different than what is pictured. So I’m assuming Yoast changed how it looks from when this was originally posted. Curious as to how to hide an opt-in PDF file (media) from google searches. The above seems to reference just pages/posts. Would I have to attempt Method #2 above to do so? Thanks! For what you’re wanting, you would likely need to use method #2 from the article. Thanks for the article. I want google to noindex my site’s member pages. You can follow the steps to make the ‘member’ page noindexed. However, the single member pages still appear. Can you recommend any solutions? I want to noindex some of the pages. I think yoast method is best. But can you tell please how many days it will take to remove these pages from google search results? Usually it doesn’t take long. However, it is up to search engines to decide when they update their index. Hi. I have password protect pages on my website that are somehow showing up in Google Search engine results and circumvent the password and shows the viewer the pages without need to provide password. thanks for the great article. I’m wondering which of these methods is preferred or do you need to do more than one of them for a pricing page for instance? I’d like to send folks to a private page and know it isn’t on google or any other search engine. Kim’s message on passwording was disconcerting. I’d like to hear your comments on that as well. You can use the method 1 to be absolutely certain that Google will not index the page. This method will make your page noindex for Google as soon as it is published. How do I hide a page that I created for the mobile site from showing up in my search list? I don’t want customers to see the mobile page on it. If I’m understanding correctly – if you use method 3 and password protect a page, it is still indexed, just not available for people to view without knowing the password. Recently my colleague created a draft page for another colleague to review (using a password) thinking that it would be hidden. However, I got a message on my phone from Google showing me there was an update on a website I recently visited – but with a note that it was password protected. This is not something I’d like anyone else to get as it would be annoying rather than useful since they wouldn’t be able to access the page. So really i don’t think it is enough to password protect something – we should probably also be doing one of the first two methods to keep it hidden. Would you agree? Thanks for a great article. This is simple, concise, and very clear. You have been bookmarked! Cheers. If I enter into that page. It shows 404 content not found..!! Is there any solution to get rid of it soon? Try to detach them using Google Webmaster tools. It might help.